If you’ve worked with, talked to, or read articles by me or Rob in the last few years, then you’ve inevitably heard us discuss or reference the Postural Restoration Institute. While PRI has become quite popular in many circles within the physical therapy and strength and conditioning fields, there are still many practitioners and non-experts alike who have not heard of it or don’t fully understand what it is. So, per a request from one of our readers, I’m going to do my best to introduce PRI, explain why I find it useful, and discuss how I implement it in my programs. Due to the abundance of information that this entails, I’ve decided to split this into a three-part series; this first installment will cover the history of PRI as well as the neurological foundation on which it is based. The Postural Restoration Institute was founded in 1999 in Lincoln, Nebraska by physical therapist Ron Hruska. Over the course of his clinical experience to that point, Ron had noticed specific patterns in the majority of his patients and found that, despite the varying nature of their issues, a common approach to their treatment often resulted in significant improvement in function. As a result, he focused on learning about the asymmetrical nature of the human body and how to integrate those imbalances into a treatment program. Thus, the science behind PRI was born. But what exactly is PRI? For many, the buzzword “posture” immediately comes to mind. This is not entirely inaccurate, since assessment of static and dynamic posture and subsequent attempts to restore neutrality are a critical component of the PRI treatment philosophy. But rather than the be-all-end-all, posture is more of a means to an end for PRI practitioners–it’s a valuable tool for assessing the neurobiological state of the patient. To sum up a tremendously complex methodology as succinctly as possible, PRI is a treatment approach that assesses the adaptability of the nervous system to various environmental stimuli via autonomic nervous system-mediated muscle activity and movement. That’s quite a mouthful, so let’s see if I can break it down for you, starting with the structure and function of the autonomic nervous system. If you think back to your high school or college anatomy class, you might recall that there are a bunch of subdivisions of the nervous system. The first subdivision is made up of the Central Nervous System (CNS), which consists of the brain and spinal cord, and the Peripheral Nervous System (PNS), which consists of all of the nerves and ganglia that lie outside of the brain and spinal cord. Depending on the source, you might see the Peripheral Nervous System then subdivided into sensory and motor divisions, with the Autonomic Nervous System (ANS) being a further subdivision of the latter. This isn’t entirely accurate, however, since the ANS does contain sensory afferents. In fact, the parceling of the ANS into the Peripheral Nervous System is also not exactly correct, since the cell bodies for some neurons of the ANS reside in the gray matter of the spinal cord. In addition, the executive control of many of the functions of the ANS belong to the medulla in the brainstem, while regulatory control belongs to other structures of the limbic system. 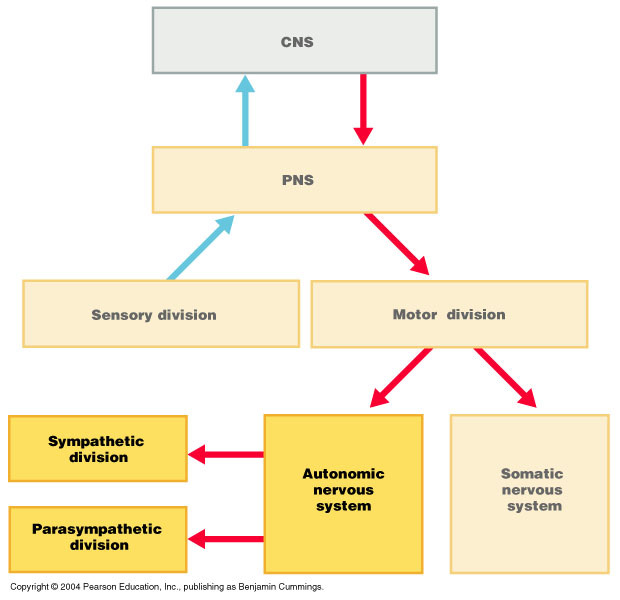 In order to appreciate the wide-ranging physiological effects that the autonomic nervous system has, it is important to understand that there is significant interplay and overlap between it and what are traditionally considered the Somatic Nervous System–the division of the PNS typically associated with voluntary movements of skeletal muscle—and the Central Nervous System. Interestingly, the beta-adrenergic receptors are more densely distributed on Type I muscle fibers than Type II muscle fibers. Coupled with the fact that Type II fibers lack phospholamban, it is possible that the aforementioned effects are more prominent in Type I muscle fibers, which are generally present in higher proportions in anti-gravity postural muscles such as the hamstrings and in lower proportions in hip flexors like the vastes muscles. This will come into play in later installments of this series when I discuss specific patterns of motor activity described by the PRI model. The takeaway here is that the autonomic nervous system–specifically the sympathetic division–may exert some degree of direct influence over skeletal muscle, enabling it to augment motor output factors such as muscle tone, muscle length, twitch force, and relaxation rate. The ANS can also affect skeletal muscle independent of the aforementioned direct mechanisms. Indirect effects are due to closely-tied neural pathways. Limbic system inputs to the reticular formation in the pons and medulla modulate autonomic function as well as posture and muscle tone via the descending pathways of the reticulospinal tract. The limbic system is largely responsible for functions dealing with emotion, behavior, motivation, and threat appraisal, which would make sense in the context of its relation to autonomic and muscle function; emotional responses such as fear or arousal are known to affect both autonomic functions (such as blood pressure and ventilation rate) via autonomic ganglia as well as resting muscle tone via gamma motor neurons that innervate the intrafusal muscle fibers of muscle spindles. The takeaway, then, is that regardless of the strength of the evidence supporting a direct effect of the ANS on skeletal muscle, the ANS undoubtedly influences characteristics of skeletal muscle and motor activity indirectly via subcortical input and reticulospinal pathways in response to emotional or threatening stimuli. The autonomic nervous system itself can be further subdivided into parasympathetic and sympathetic divisions. The parasympathetic division is usually characterized as responsible for “rest and digest” functions, while the sympathetic division is characterized as responsible for “fight or flight” functions. While sympathetic activation can generally be thought of as an increase in effector activity and parasympathetic activation can generally be thought of as a decrease in effector activity, this is not always the case. It is important to note, however, that most organs receive dual innervation by both divisions, which are concomitantly active to varying degrees. Thus, while someone might be described as being in a “sympathetic state,” that does not mean that the parasympathetic division has been turned off. Rather, it means that the parasympathetic division’s input has been decreased or its associated receptors have been down-regulated or desensitized. The sympathetic nervous system is known to be activated by stress. The human body is effectively indiscriminate about the nature of the stress, which means that psychological, emotional, and physical stresses elicit a similar response, although that response may vary in intensity. While many are quick to demonize sympathetic activity and frame it as detrimental to health, it would be shortsighted to overlook the fact that sympathetic nervous system activation is a normal physiological response that is necessary for our survival. Problems can arise, however, when the sympathetic nervous system is overstimulated as a result of chronic stress and/or the Ventral Vagal Complex (VVC), a branch of the vagus nerve which is normally responsible for inhibiting sympathetic response in the face of stress, fails to do so. Much like the sympathetic system, the parasympathetic system is physiologically crucial to our survival, and decreasing its activity secondary to increased activation of the sympathetic system can impair the “rest and digest” functions that are critical to recovery and general physical and mental health. Thus, if we constantly bombard ourselves with various forms of stress and/or impair the ability of the VVC to regulate sympathetic output, never letting the ratio of autonomic activity return to a state that’s more parasympathetic-dominant, then we are promoting rigidity of the autonomic system, which impairs our ability to adapt to different stressful stimuli. To put it another way, the VVC acting as a brake on sympathetic output allows us to respond to stresses in a variety of ways; we can respond to a certain stress with self-calming or with social behaviors, or we can respond with the typical fight or flight response. Failure of the VVC to inhibit defensive neural circuits, however, limits us to a single type of response that is, when chronically activated, extremely costly both physically and mentally. Using the analogy of a light switch, it’s not that “turning on” the switch is problematic, it’s that being unable to “turn the switch off” can prove to be costly in the long run. Why should you care about any of this? With regards to athletes, it’s been said that the best are not the ones who can get “jacked up,” or into a sympathetic-dominant state, the fastest, but rather the ones who can most efficiently switch out of a sympathetic-dominant state and into a more parasympathetic-dominant resting state. This makes sense logically: if you’re not working, then you should be resting to conserve and restore energy, and an inability of the nervous system to adapt to this change in stimuli or to depress sympathetic activation in the face of stress (via VVC activity) and shift autonomic states can impair this process. This notion has been bolstered by studies examining the relationship between vagal tone and heart rate variability, which are known to reflect autonomic nervous system activity and have been linked to general health concerns such as cardiovascular disease, hypertension, and depression, as well as fitness-specific concerns such as overtraining or detraining. With regards to the general population, it is possible that this same mechanism is related to the biopsychosocial model of pain. Psychological and social stress has been linked to failure to alleviate conditions involving pain, so it is possible that failure of the VVC complex to mitigate chronic sympathetic activation plays a role. While this has been postulated in the literature, the evidence for this particular relationship in vivo in humans is scant at this point in time. Roatta S & Farina D: Sympathetic actions on the skeletal muscle. Exerc Sport Sci Rev. 2010;38(1): 31-35. Passatore M & Roatta S: Influence of sympathetic nervous system on sensorimotor function: whiplash associated disorders (WAD) as a model. Euro J Appl Physiol. 2006;98: 423-449. Santini M & Ibata Y: The fine structure of thin unmyelinated axons within muscle spindles. Brain Research. 1971;33: 289-302. Ondicova K & Mravec B: Multilevel interactions between the sympathetic and parasympathetic nervous systems: a mini-review. Endocr Regul. 2010;44(2): 69-75. Boulton et. al: Effects of contraction intensity on sympathetic nerve activity to active human skeletal muscle. Front Physiol. 2014;5: 194. Birznieks et. al: Modulation of human muscle spindle discharge by arterial pulsations – functional effects and consequences. PLoS one 7.4, 2012. Lynch G & Ryall J: Role of β-adrenoceptor signaling in skeletal muscle: implications for muscle wasting and disease. Physiological Reviews. 2008;88(2): 729-767. Knutson G & Owens E: Active and passive characteristics of muscle tone and their relationship to models of subluxation/joint dysfunction. J Can Chiropr Assoc. 2003;47(4): 269-283. Alvares G et. al: Reduced heart rate variability in social anxiety disorder: associations with gender and symptom severity. PLoS one 8.7, 2013. As a rookie in the world of strength and conditioning, I really appreciate this write up and the PRI related videos that you guys have posted. I think it was Mike Boyle that said that we are leaving the FMS decade and are about to enter the PRI decade in the athletic performance field- it’s an exciting time, for sure. This system makes sense and answers so many questions that previous systems left unanswered. I’m looking forward to parts 2 and 3. Keep up the great work, Fellas. John, we appreciate your positive feedback. If there are any other topics you want us to discuss or if you have any questions you want us to try to answer, then don’t hesitate to let us know. Best of luck with everything.